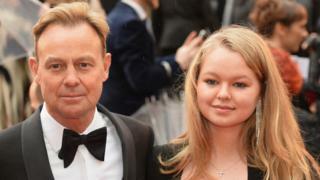 Jason Donovan's daughter is following in his footsteps and joining Australian soap Neighbours. The actor and singer found fame playing Scott Robinson on the show in the 1980s. Eighteen-year-old Jemma Donovan will play Harlow Robinson on the soap and will appear on screen in July. Her grandad Terence Donovan, Jason's father, has also appeared on Neighbours - he played Doug Willis for a number of years . Jason tweeted and posted on Instagram his pride at the news. "Neighbours has been an incredible launching pad for so many careers... still going strong!!" He added "three generations of Donovans on Ramsay Street has to be a first". He said he can't wait to see what she does with her part and "watch her blossom as an actress". "Work hard, have fun and enjoy the process. So proud of you Jem," he added. Jemma starred alongside Hugh Bonneville in the BBC One film Mr Stink at the age of 11, and then played the lead in the 10-part Netflix series Spotless in 2015. She said she was "happy and honoured" to be joining the show. In a statement announcing her casting Jason said: "Neighbours is an incredible learning curve for any young actor. It's become an institution and I'm so grateful for my time on Ramsay Street. "There are so many great memories for me looking back, and to be honest this is Jemma's moment. My Dad had a wonderful few years and I'm sure Jemma will also embrace the experience and honour the past. "She needs to look forward, be an open book, learn from her experiences and have some fun. What an opportunity!" he said.